I gave facilities for kids 5 stars. There's is a beach, sea, driftwood, streams, rocks what do they need more ? No facililties but nature compensated that 100 %. What a spectacular place. The path/road to the campsite was tricky. Really wild camp ground at a stuning place. Great start for walks to Sandwood Bay. Track to access the campground was really bad. We were happy to drive a Landrover Defender. There are no facilities and no shop reachable in a few of minutes. Next public toilet is by the public parking at the starting point of the Sandwood Bay-Walk. Having returned to this site after seven years I was happy to see the quality of green space recovered from the sand and the obvious care put in by the "Trust". We spent two weeks here recently, and enjoyed it greatly for the most part. I must recommend the local store which has just about everything and better quality than the local Spar Store. For the most part, campers were most respectful of your privacy and space. However I did find myself in agreement with the previous comment concerning Bank Holidays. 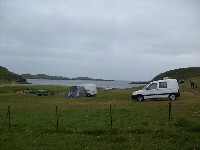 We saw the site turn from an idyllic wild campsite overnight. The usual disregard for others on a commercial site was also witnessed with the complete disregard of the requests to keep off the conservation spaces over the Burn. These were used by others as a both campsite and recreation area. I would urge the John Muir Trust to put up much larger signs and to include the Head Ranger's contact number. I would also recommend not visiting over Bank Holidays, as we plan to do next year. Camping at the small sandy bay is allowed. There are no facilities other than a water pipe near to Sheigra House. See website link for advice on camping here and at other wild camping sites. From the 31st October 2011 no cars will be allowed on to the camping area to enable the machair to recover and hopefully thrive. ( Cars will have to be left adjacent to the cemetery about 1/4 mile away). Tents should not be pitched between the burn and the beach for this reason . Notices have recently been placed on the entrance gate with these requests. So please read all and adhere to all notices to keep this unique place open to all. Please respect this area as it is part of the John Muir Trust and damage could easily lead to its closure. Be prepared for there being no facilities. The sign on the gate. 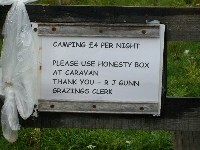 Add your review to Sheigra Wild Camping with the form below. Just returned from a quick tour over the bank holiday. I had read promising reviews of this place and decided to visit, and was sadly disappointed. 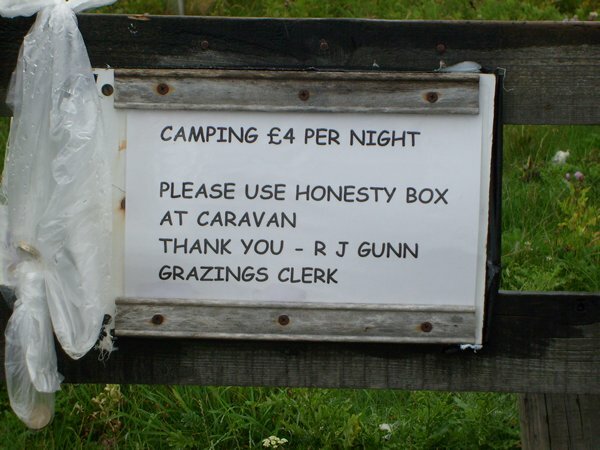 It was so busy it could be classed as a campsite without facilities. It is not that stunning a location. Being Scottish and having travelled all over Scotland and the Hebrides etc. there are better locations with better scenery etc. Don't get me wrong, it is nice, just not as fantastic as portrayed by other reviews. Apparently no cars are allowed on the machair, and no camping is allowed on the left of the burn as you approach the beach. However there are no signs on entry relating this information so people are still driving on the machair and camping on the left. Water supply from hose near the caravan, honesty box on the caravan, please use it. a jewel at the end of a single track road completely unexpected and unspoilt. with scenery like this you don't need anything else. facilities and staff would totally spoil it.children, dogs and adults can all enjoy the beach. will visit again and try the walk to the haunted beach just a bit further back on the road. 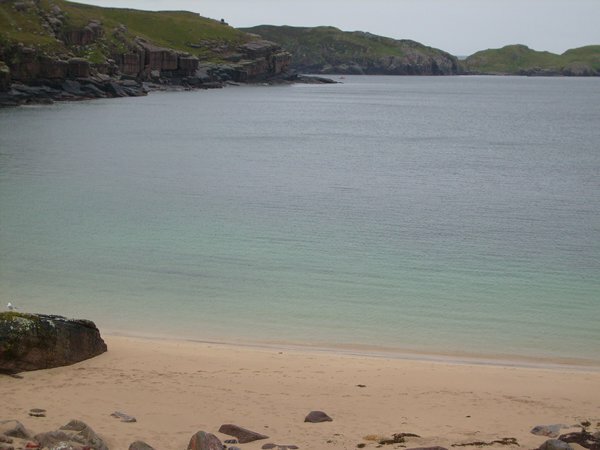 Stunning location and coastline , ideal base/stopover for walking sandwood bay and beyond. No water supply when I was there June 2011. 2 of 13 found this review to be helpful. Fantastic location, great scenery & wonderful base for exploring further north - we just left the tent there for 2 days whilst we walked upto Cape Wrath. It can be muddy and if you vehicle has a low ground clearance, take care & restrict yourself to the lefthand side as you approach, but if you have good clearance then the far right is the quietest and furthest away from people. If you like it wild, then this is one of the best I have come across. Watch out in hot, calm weather though - it is a sun trap and when there is no breeze the midge can be a problem. We dealt with this issue by taking the stove and meals out onto the cliff top to catch the breeze. (left hand side (north) was better it was in the shade for much longer. 5 of 19 found this review to be helpful. Beware - This site is totally addictive, intended to stay for two nights which turned into six. Nothing but scenery, sand and sunsets. This is well worth a visit. Great location with beautiful views. We spent 1 night and day with great weather. Would have stayed longer if we had had more provisions and gas. It gets 3 stars for Facilities for Kids as it has Sea, a lovely sandy beach and rocks to climb. Entrance was slightly tricky for Motorhome with the ground dry, so may inaccessible for some if the ground is soft or muddy. Look out for the honesty box at the house on the main road. Wonderful site but can be muddy in wet weather. So if in camper - walk and recce the site first! Large hard standing area next to cemetery (unofficially) can be used if ground sodden. Still use the honest y box though. If there were any staff they would be beyond compare. No organised facilities for kids and isn't that a good thing, make them devise their own entertainment for a change but there's rock pools,sand, sea, board games, cards, stories and craic. Location - Sea, sand, cliff and complete isolation...wow! Honesty box at the end of the road and a fresh water supply at the cemetry..what more can a man/woman ask for! Beautifull site that appearsd at the end of a road to nowhere. The Views are spectacular and the walks on the cliffs are out of this world in good and bad weather. If in a caravan then during bad weather teather it down !!!! Water can be found at oldshoremore. highly reccommend to anyone wanting to get away from anything..